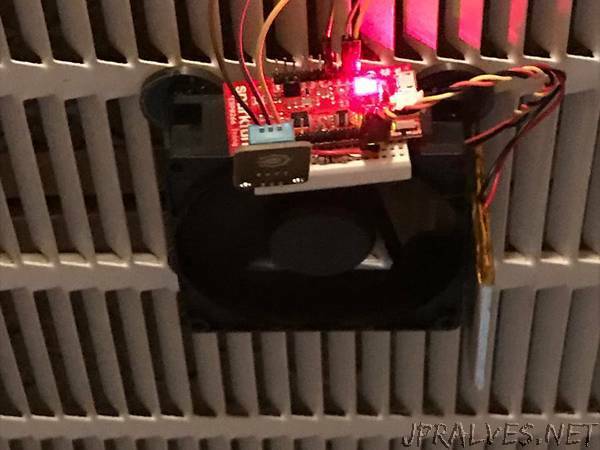 “Monitors the fan speed, on/off cycles, temperature, and humidity of my HVAC system and posts data to ThingSpeak.com. I built this project for two reasons. (1) I’ve been looking for an excuse to play around with IoT, and with the ESP8266 in particular. (2) My electric bill has been steadily increasing and I wanted to see how often my HVAC system was cycling on and off (and at what temperature). I figured I could monitor on/off cycles by attaching a small DC fan motor to the return air grill. When the HVAC unit turns on, the airflow will cause the fan to turn; acting as a generator. I can then read the voltage generated by the fan motor by connecting it to an analog input pin on the ESP8266. I thought I might also be able to determine the fan speed by the variation of the voltage generated. And I might as well measure the temperature and humidity while I’m at it.